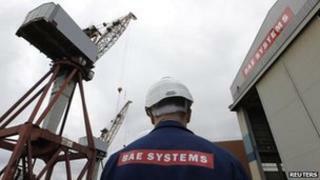 One of BAE Systems' major shipyards could be closed, the company's UK chief, Nigel Whitehead, has said. He told the Sunday Telegraph a decision would be made by the end of the year. The firm was working with ministers to explore all options for maintaining the UK's shipbuilding capability, he said. The future of its three main shipyards - in Portsmouth, and Govan and Scotstoun on the River Clyde - after two new aircraft carriers are completed has been in doubt for some time. There are fears there will be insufficient work available to keep all three busy and profitable as cuts in defence spending take their toll. "The issue is how to consolidate... but make sure that we've preserved the capability to design and manufacture complex warships," Mr Whitehead told the newspaper. "We anticipate that there will be a reduction in footprint and we anticipate... that part of that might actually be the cessation of manufacturing at one of the sites." Closure looms for one of Britain's three remaining Royal Navy shipyards. And so does a renewal of hostilities over the politics of where they're located. Earlier this year the company appointed consultants to carry out a review of the business. The firm's yard in Portsmouth is widely believed to be the most vulnerable, with 1,500 jobs at risk. However, two bases on the River Clyde, at Govan and Scotstoun are also under scrutiny. BAE Systems says it is working closely with the government to explore all options for maintaining the UK's shipbuilding capability. The Ministry of Defence says that it is up to the company itself to decide how best to deliver the naval vessels it has already agreed to produce. In October, BAE Systems and Franco-German firm EADS cancelled their planned merger, after talks were thwarted by political deadlock. The UK had wanted its counterparts to agree to limit their influence in the merged firm in order to maintain BAE's strong working relations with the US Pentagon. BAE Systems: Where now for the UK's biggest manufacturer?